I adore quick breads, they have a certain appeal to them…beyond their ease of preparation–to me they exude a high level of hominess and are the perfect giftable baked good! If you are a baking newbie, a quick bread is well, quick and is leavened through the use of a chemical leavener such as baking soda or baking powder. 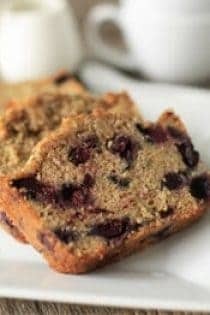 Although my absolute favorite quick bread is of the banana variety, this Blueberry Zucchini bread is absolutely delicious and could easily go head to head with your best loaf of banana bread! 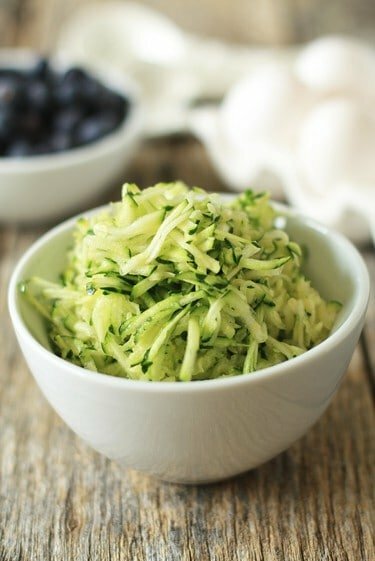 The shredded zucchini imparts a moist and almost creamy texture, while the addition of whole wheat flour adds just the right amount of nuttiness. The fresh blueberries end up bursting in your mouth and make the bread taste really fresh and wholesome. Plus, I think the opportunities to healthify this recipe are awesome–think toasted nuts, wheat germ, apple sauce…oh the possibilities. If you make this and adapt it, definitely come back here and let us know your result! 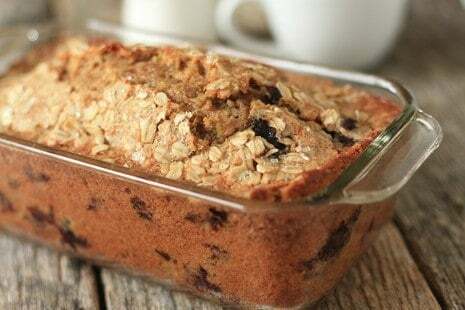 This particular Blueberry Zucchini bread is not overly sweet, so you can definitely experiment with the amount of sugars to appeal to your taste buds; personally, I liked this quality of the bread. I sprinkled a little bit of oatmeal and coarse sugar on the top for visual appeal added texture. This bread was awesome toasted and spread with a bit of butter–perfect for breakfast with a cup of hot tea! In other news, I am 31 and think I have just developed allergies. I. hate. them. So I am going to go pop some more Benedryl, have a few more sneezing fits and bury my face in blanket! Have a fabulous day! - No whole wheat flour? Simply sub in the all-purpose flour. - No brown sugar? Simply sub in white sugar. - No loaf pan? Make muffins--note the cooking time will be shorter if making muffins.